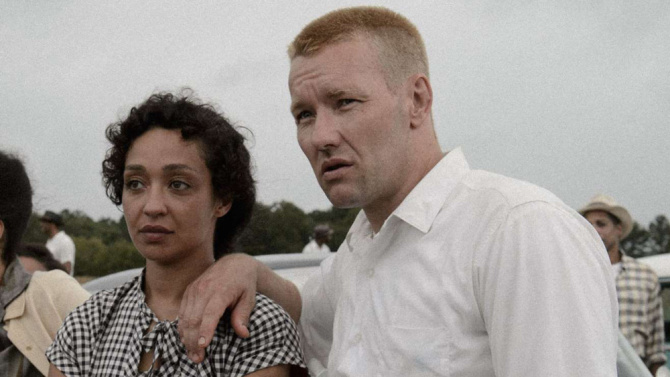 As racial tensions flare up again in America, Loving is certainly a timely film. However, it never finds a solid focus. At first a romance, then a biopic, then a historical drama, Loving suffers from an identity crisis. Any one of these would make for a decent film, but smushed together they result in a film that is average at best. Richard (Joel Edgerton) is a blue collar worker who makes a living building houses. He falls in love with Mildred (Ruth Negga) and the two go up to D.C. to get married. The local folk don’t take kindly to such a union and the judge decides to exile them from the state even as Mildred is expecting their first child. At first, the film is a quiet, sweet romance between two souls caught up in a world that does not accept their relationship. The interracial marriage is seen as an offence to both man and God. Once this element enters, it begins to shift to a drama about this couple’s journey to right a wrong and see justice served. But late in the film a scene where Michael Shannon has to show up–this is a Jeff Nichols’ film after all–as a Life photographer and there’s this momentary glimpse of a biopic investigating the lives of these two sweet, unassuming people and who they are. And it’s a shame because Jeff Nichols’ style fits perfectly with this real-life story about two sweet, blue-collar people caught up in a world of fear, hate, and violence. But there’s not enough to sustain the film’s runtime. Nothing is developed satisfactorily. It’s unclear what the takeaway is supposed to be. The characters aren’t given enough definition and the historical importance seems almost secondary to the film. It doesn’t help that the actors involved in the supreme court case seems uneasy with Nichol’s direction style. There are a handful of things to like about this film, but nothing to love.